Highlighting some of the best of what the internet has to offer squash players, whether you want keep up with the latest from the world of squash or you want to improve your game. LIVE WEB STREAMING is now available for all of the major PSA tournaments at the new PSA LIVE site. There is also a live scoreboard available free of charge. Also see a list of Video Clips of the top players in action, from various sites including guide-to-squash. "..keep up to the minute with Live Web Streaming - great for broadband users"
SQUASH ON TV . Check when squash is on the box. 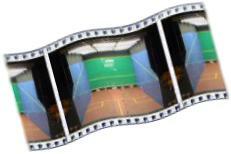 From highlights of the PSA and WISPA tours to live matches of the British Open and the Super Series Finals. You can follow all the latest news, draws and results online of all the major squash events including the forthcoming English Open from 17-21 August from Sheffield's famous Crucible Theatre, the Gerrard Grand Prix at the nearby National Squash Center, Manchester in September and the British Open now also in Manchester from 09th -17th October. You can now buy your tickets for all these events online. For all the latest SQUASH NEWS your first stop should be The Squash Site . Get comprehensive coverage of your favorite players progress in tournaments big and small from around the globe, their current RANKING or find out all the hot gossip and news snippets from the world of squash. You can read some of the best commentary and interviews around from witty and insightful journalist Framboise Gommendy or the the latest "news, views and reports from the experts" in The Squash Site's Kaleidoscope. As well as news The Squash Player has great collection of articles from a range of columnist and a large archive. Also see Global Gallery, Martin Bronstein's interesting monthly column on the world of squash on SQUASHTALK. The glamorous Vicky Botwright (who occasionally plays for Grove Park). Her website hasn't been updated recently but still some interesting photos. Full Listings of other players' sites can be found here. ...look, she's got a squash racquet!" "Terry, just because I'm on the same court as you doesn't mean it's your stroke!" Ever wondered why your opponents start swearing at you every time you claim for a stroke? Find out why by reading all the latest Rules from the World Squash Federation. Squash just narrowly misses out on the vote in Singapore to become one of the sports at the 2012 Olympics. Why squash isn't an Olympic Sport? The official story of the bid to put this right. The passionate response to the article predicting the "sad and lonely death of squash" and the recent u-turn of the offending author, Matthew Syed, now supporting squash's Olympic bid. Squash - the State of the Games. The WSF's Ted Wallbutton rounds up where squash stands in the world's major games. Squash makes it onto the list for priority funding. For a complete interactive guide to improving your game see Liz Irving's guide-to-squash. With the use of streamed video clips this groundbreaking site takes you through personal lessons, tips and drills for beginners as well as more advanced players. Get advice online on all aspects of the game from a vast range of experts in the SquashSite Clinic. Also see, eclectic Squash Links & articles from this American site and advice from squashclub.org. If you're like me and think squash is all about running around a court as fast as can and hitting the ball about until your exhausted, apparently we've being doing it wrong all this time or so says former World Veterans Champion, Robert Forde, in this fabulous set of articles entitled "How To Play Squash". Forde, who by all accounts hasn't done anything as undignified as running since the late seventies, describes how to outplay your opponent with low risk/high reward shots and the use of doubt, delay and deception. You probably saw World No.1, Peter Nicol (and John White) in the flesh at Grove Park in the recent(ish) exhibition match. Improve your game with advice from one of the greatest ever players in Peter Nicol's Top Ten Tips. Also find out about his interactive coaching CD-Rom . It gives instruction how to play the many different squash strokes with video footage of real life tournaments. You can even create your own digital video images and compare them with Peter. Its always difficult buying a new racket you really like. Make the decision easier by browsing through this database of squash equipment reviews by ordinary players. You could even add your own review.